Brodie summarizes the three parts to Ehrman’s book and then responds. A summary of his summaries follows. It dwells mostly on Ehrman’s argument about oral traditions since Brodie (as I have posted recently) is particularly critical of the way biblical scholars “uncritically” rely upon oral tradition to make their reconstructions of Christian origins work. Ehrman’s argument is that all Gospels, canonical and noncanonical, all testify to an historical Jesus, and they are all so varied, each with its own unique material (despite some undoubted borrowing from Mark), that they have to be considered to be relaying to readers independent witnesses of this historical Jesus. Examination of the Gospels further “indicates that they all used many diverse written sources, sources now lost to us. . . .” — known as Q, M, L, a Signs Source, a Discourse Source, a core version of Thomas, etc. All of these “sources” also speak of Jesus as an historical person. It is also clear that they are independent of one another, so they can all be considered independent witnesses. It is thus inconceivable that they all derive from a single source. 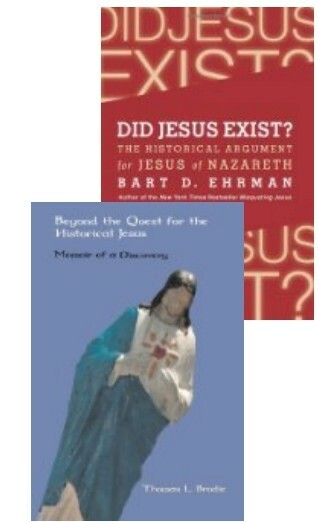 They must all ultimately derive from various witnesses to the historical Jesus. Further, some scholars date Q to the 50s, 20 years after Jesus’ death. And others have “mounted strenuous arguments that” — and one recent study “makes a strong . . . literary . . . argument that” — sources underlying Peter and Thomas date even earlier than 50 CE. Other NT sources, the letters of Paul and others, as well as the writings of Ignatius, 1 Clement, Papias — all, according to Ehrman — speak of Jesus as historical and they are all either independent of one another or demonstrably independent of the Gospels, so we can only conclude they acquired their knowledge of Jesus from oral tradition. Ehrman’s argument is, Brodie summarizes, that mythicists like Price and Thompson exaggerate the similarity of the stories of Jesus with other myths. Besides, saying that the life of Jesus could be written as a paraphrase of the Old Testament stories is a “weak and irrelevant” argument. One does not conclude that the French Revolution never happened because The Tale of Two Cities by Dickens is fiction. Jesus was a “carpenter” who became an apocalyptic prophet. He may have been like an Essene but was not an Essene. He preached the imminent advent of the kingdom of God, and was somehow misunderstood by the Roman authorities as one who claimed to be a self-appointed king. That’s why he was crucified. But we know there has to be a ‘but’. Specifically here, Brodie describes Ehrman’s reliance upon the “hypothetical documents” of Q and the core of Thomas as “skating on thin ice”. the reader who tries to track down that logic by going back to the cited author will discover that the argument, which remains elusive, presupposes having read the author’s yet earlier work. Thomas Brodie gently leads up to a damning indictment of Ehrman. Ehrman is way behind the times. Ehrman is regurgitating scholarship of the 1950s apparently completely unaware of any developments since the 1980s. There is no need to skate on thin ice, says Brodie. Nor is there any need to resort to oral tradition to explain the contents of the Gospels or other New Testament literature. This is a theme I and others have often raised in recent years. Brodie does not mention here the fall of the Temple and Jerusalem in 70 CE, but surely we know enough of the diversity of Second Temple Judaism to postulate the possibility that the rabbinic movement was not the only response to that destruction. Or just how diverse was Second Temple Judaism? Brodie calls upon the conservative N. T. Wright (2005) to testify that recent scholarship, with “its eyes newly opened by contemporary literary study”, is testing Paul’s works for all kinds of “implicit and explicit [Old Testament] storylines”, and adds that the Gospels, likewise, are being exposed as being built upon the same foundations. Where is Ehrman in all of this? Note #6 above! Recall or read for the first time my 2006 post! On #7 I would like to say much, too, but here Brodie tags a lengthy footnote, so I think it would be unfair for me to raise my objections while not giving him a full hearing, too. Maybe this can be the topic of a future post. The image of a crucified messiah is indeed countercultural, yet, given how biblical writers had long set narratives in opposition to one another and had refashioned older scriptures, it makes sense as part of a fresh synthesis of several Old Testament/Septuagint texts (e.g. Isa. 52.13–15.12; cf. Acts 8:30-35; Lk. 24.25-27) that deal with the tension between suffering and God’s hope. What is especially new about the crucified messiah is not just the seemingly radical contradiction of combining goodness and suffering, hope and despair, messiah and crucifixion, but also the stark image through which that contradiction is portrayed — Roman crucifixion. Yet such a process of adaptation is not new. When Luke was using the account of the death of Naboth to depict the death of Stephen, he replaced the picture of the old institutions, the monarchy and assembly, with Jewish institutions of the first century — the synagogue and Sanhedrin. And when he was using the account of the exemplary foreign commander, Naaman, he changed the nationality from Syrian to Roman, Roman centurion. So when there was a need to express the ancient contradiction of paradox between God-based hope and life’s inevitable sufferings it was appropriate to express those sufferings in a clear contemporary image — Roman crucifixion. Though Ehrman seems to set up a false dilemma for his readers — believe Jesus was historical or abandon Christianity and God — Brodie offers an alternative hope. Posted on 2012-11-07 22:02:54 GMT+0000 by Neil Godfrey. This entry was posted in Biblical Studies, Book Reviews & Notes and tagged Bart Ehrman, Brodie: Beyond the Quest for the Historical Jesus, Oral Tradition, Thomas Brodie. Bookmark the permalink. Yes there is a significant known source for the Christian Bible, The Jewish Bible, and the desired source of oral tradition is unknown. You can go beyond this to add that Paul explicitly and repeatedly testifies that Revelation showed him Jesus in The Jewish Bible and that Paul is likewise the only significant known author before “Mark”. Does Brodie miss this? Brodie argues at length, and refers to other arguments that do the same, in other places that the gospels used Paul’s writings. I don’t know why it’s not understood that Pauline epistles don’t show up until Marcionites show up in history. And, worse, instead of writing an accurate and true history of the “orthodox”, proto-Catholic church – they chose to write a tale of fantasy known as “Acts”. Why didn’t someone write a true history? UNLESS, unless there was no true history for anyone to write. IOW, maybe they just made it up as they went…you know, like the Mormons did. The main reason is that when Paul does make his first explicit reference in the external record he is already a figure of high importance. This implies that he was not created at this time but was known and referenced at this time because of his already high reputation that necessarily came from an earlier era. A third option is that of Parvus, Detering and those who argue that Paul was a cipher for Simon Magus. In this case what we are witnessing in the second century is the first spin-off impacts of the orthodox re-casting of Simon as Paul. Personally, I simply don’t know what to do with Paul. I have ordered two books by Richard Hays about Paul because of their insights cited favourably by polar-opposite scholars T.L. Brodie and N.T. Wright. Maybe they will help resolve my quandary, or leave me more uncertain. I would think that the Simon Magus story sounds more like Marcion than Paul. Unless, of course, Marcion was actually the one who wrote the Pauline epistles using the name of Paul. Which, if Marcion did write, say Galatians, then those letters were edited to sound orthodox. I can’t imagine that Marcion would present a letter in support of Marcionism that had the Gal. 1:19 passage in it. Sometimes I think that maybe the whole NT Canon came about as the result of the Marcionite church and the orthodox church writing tracts against each other. But, how would anyone today ever know whether that was the cause or not? Does he mean “extant when the Gospels were being written” (which is pretty much what the Q camp claims) or extant now? If now, which texts? Brodie is talking about the Gospels. Q was, in effect, the Septuagint. John reworked not only Mark but also Matthew.